Austin Dillon will drive a mostly black No. 3 Chevrolet sponsored by Dow Chemical next season. Richard Childress and Dale Earnhardt loved to hunt nearly as much as they loved to race, and they were equally competent in both sports. But while hunting in New Mexico in the mid-1990s, the two encountered icy mountain conditions. While trying to navigate the treacherous terrain, one horse slipped and Childress ended up with a painful fracture of his sternum. Later that night, the two made a solemn vow to each other: If something happened to one of them, the other would keep racing. No matter what. Afterward, Earnhardt told Childress that when he quit driving, he wanted Richard Childress Racing to continue to compete in the NASCAR Sprint Cup Series and with the No. 3 on the side of its cars. After Earnhardt’s untimely death in the 2001 Daytona 500, Childress decided the No. 3 would never again compete at the Cup level for RCR unless he could put one from Earnhardt’s family behind the wheel, or one of his own. 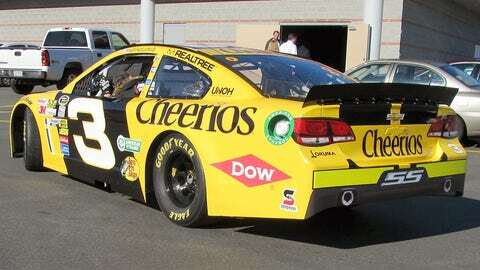 Austin Dillon will carry primary sponsorship from Cheerios, a General Mills brand, in select races in 2014. 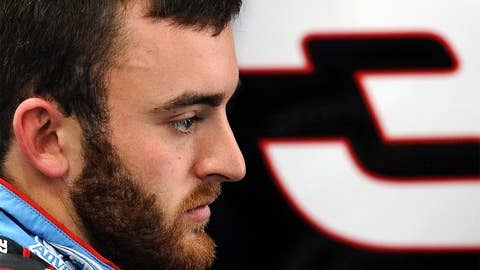 Wednesday, that day formally arrived, with the announcement that Childress’ grandson, Austin Dillon will drive the No. 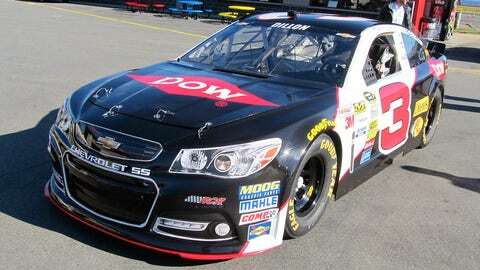 3 RCR Chevrolet SS next season, with sponsorship from Dow Chemical, General Foods and Bass Pro Shops. "Having my own grandson be able to get in that car is really special," Childress said after Wednesday’s announcement at Charlotte Motor Speedway. "I just think back to a conversation Dale Earnhardt and I had riding back over New Mexico from a hunt. Those are the kinds of things that help bring back, ‘Hey, it’s time to bring it (the No. 3) back and bring it back with family.’ I’d never put no one in it but family, an Earnhardt or one of my family." Dillon was a No. 3 loyalist almost from birth, or at least from his very early childhood. "As a kid, he was a big Dale Earnhardt fan," Childress said of Dillon. "I’ve got pictures of him in a Goodwrench uniform, with Chocolate (Myers, Earnhardt’s long-time gasman) holding him, Dale holding him. He was just always like that. He used the No. 3 when he played in the (Little League) World Series, on his go-karts. He’s always loved that number and that’s what he always wanted to use." For his part, Dillon is acutely aware that some fans won’t like him having the number, but he said most of the reaction he has gotten in his four years using the No. 3 in the NASCAR Nationwide and Camping World Truck series, respectively, has been overwhelmingly positive. "You’ve got to be comfortable with what you’re doing, I guess, and approach it with grace," said Dillon, who will run for NASCAR Sprint Cup Rookie of the Year honors next season. "I had the peoples’ approval that I felt that I needed to get in the seat and run the number." Those people included both Dale Earnhardt Jr. and his sister, Kelley Earnhardt Miller, who both said they supported the move. Dillon said fan reaction to him using the No. 3 has been overwhelmingly positive, as well. "To see the fans light up at every autograph session, excited, (asking) if we’re going to bring it back, asking those questions â¦ I might hear a jeer as I’m walking away or driving away, but at autograph sessions, I’ve never had anybody not positive about it. If I was getting beat up every time I went to an autograph session because we were thinking about it, then it would change my mindset. "But they were so excited about, ‘Man, we want to see it back, we’re in support it.’ And they’d tap your card while you’re signing it, and that’s what you remember at autograph sessions."